Our character in this new running game for girls will be the one and only Brave from the story and also the movie that you all saw. 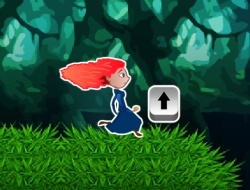 You will need to keep her safe in order to finish this lovely game but keep in mind that there will be tons of obstacles in her way that you have to avoid. Keep trying your best to jump over the gaps and also you will need to try jump over the puddles because she can slip and fall and you dont want her to get that pretty curly hair of hers wet. She is striving to live her life on her own terms and you should do that as well. Brave Run 0.00 between 0 and 10 based on 0 votes.